Samira Ahmed is an awardwinning journalist and broadcaster. She presents the BBC Radio 4 arts show Front Row and Newswatch on BBC1 and is a visiting professor of journalism at Kingston University. 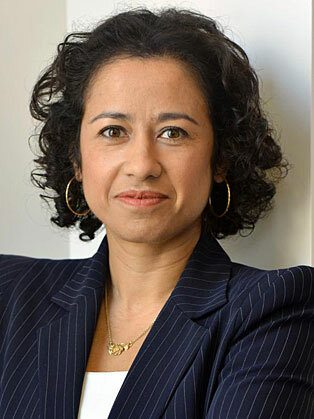 Samira studied English at St Edmund Hall Oxford and began her career in 1990as a BBC News Trainee. She's worked as a correspondent on the Today programme, Newsnight and was the BBC's LA Correspondent covering the OJ Simpson case. Samira was also presenter at Deutsche Welle TV in Berlin and spent 11 years at Channel 4 News where she won the Broadcaster of the Year award. Her BBC documentaries have explored such topics as David Bowie, the invention of the atomic bomb, the wife of Oliver Cromwell and the Little House on the Prairie novelist Laura Ingalls Wilder. Her writing appears in many magazines and newspapers including The Guardian and The New Statesman. We are delighted that Samira enjoyed working on the women’s rights event we hosted back in November. We certainly enjoyed working with her and were impressed with the seamless way in which she was able to pull together the disparate parts of our event; her knowledge on the issue at hand; the way in which she engaged with and welcomed guests; her assertive yet friendly style when chairing the panel discussion; and the genuineness of her approach – this was clearly a subject she was personally interested in.